Kenworth trucks offers a wide variety of top quality parts and truck services. The customer service is extravagant, and the materials they provide is the most useful known nation wide. Newer models of Kenworth trucks are the Kenworth T660 which is the most highly evolved aerodynamic long-haul conventional, period. The objective for the Kenworth T660 was to cut fuel consumption to the bone, then the result was the new T660 – nailing the objective head on. The T600 started it all for Kenworth Trucks. Advances in styling, simulation technologies, rapid prototyping and durable, but weight-saving materials come with the advances that was sparked through the years, and Kenworth Trucks have been keeping up the pace. Labeled as the perfect truck, the T660 model built by Kenworth’s engineers has unsurpassed aerodynamics that make it the perfect truck for line haul applications. Maneuverability is key, but when you think of Kenworth Trucks that’s what you get – the best. The Kenworth Truck Company was founded in 1923 and is supported by an extensive dealer network of more than 290 dealer locations in the US and Canada. The dealer network they have running provides parts, service and body shop support for customers under the Kenworth PremierCare Parts and Service. 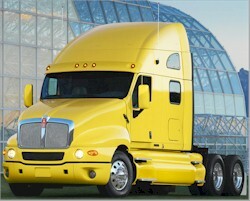 Kenworth Trucks is a leading manufacturer of heavy and medium duty trucks. The company upholds its headquarters in Kirkland, Wash. And operates manufacturing plants in Chillicothe, Ohio; Ste-Therese, Que. ; and Seattle and Renton, Wash. Kenworth Trucks operate 24 hours a day, seven days a week for sheer customer support and franchising. In the early 1900s dramatic changes to the Northwest brought the Model Ts, who in which challenged the horse and carriage in the transportation race. Seattle businessman Edgar Worthington was managing his mother’s complex, occupied by a car and truck dealership. Captain Frederick Kent had acquired the company and renamed it the Gersix Motor Company. In 1919, Frederick Kent retired from business and his son, Harry Kent became Edgar’s new partner in the car industry. In 1923, the transaction was completed, and it marked the beginning of a new era in time. The company was later known as Ken-Worth, named after the two principal stockholders Harry Kent and Edgar Worthington. Wildcat 300 STR for the roads!